How important is Quad Core for Lightroom ? Discussion in 'Mac mini' started by Fanner50, Oct 29, 2014. I want to replace my Mid 2010 Mac Mini with something more powerful with all the modern connections. 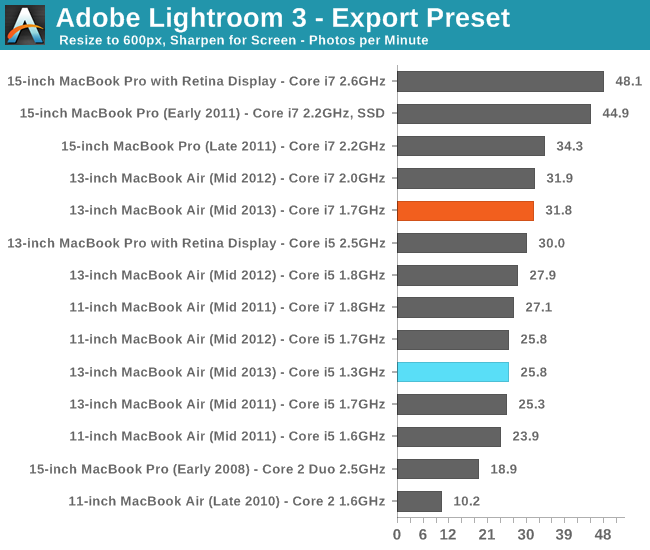 How much will the lack of quad core in the late 2014 Mac Mini be for working in Lightroom or Photoshop? How much difference will there really be between dual core and quad core using these applications? Like most, I am very disappointed that the 2014 Mini does not have a quad core processor, but will I Really notice the difference running Lightroom or Photoshop Elements, or should I bite the bullet and get an iMac? Thanks all. What about the difference in gpu? Intel 4000 vs. iris? You'll hear arguments on both sides from that one... My wife has a 2012 rMBP 13 Ivy Bridge HD4000 and Yosemite basically feels the same as my Iris equipped 2013 rMBP 13. When gaming and running at crappy resolutions like 720P, the HD5000/Iris can be up to 25% faster, but when you run it up to decent gaming resolutions like 1080P any modern game brings both iGPUs to a crawl unless you turn down all the eye candy. The mini isn't really a gaming machine IMHO. Now, if Apple wasn't being such cheap bastards and put a proper Iris Pro in the top of the line MM, then we wouldn't be having this conversation as the Iris Pro is in an entirely different league as it comes close to the GPU performance of my 2012 rMBP's GT650M's dGPU performance at times. Thanks, I am more concerned about Lightroom or iMovie than gaming. Can you give some insight there with respect to gpu differences. Quad-core will make importing/exporting faster. It won't really do anything for image editing when you're applying edits to a single image. Single-threaded CPU performance will be the bigger factor for editing single images. Lightroom runs great on my dual-core 13" rMBP which is the same guts as the 2014 Mini. Exporting a bunch of images does take some time though. Also, there's no GPU acceleration in Lightroom. None. Having a faster GPU will make no difference, and my Iris Graphics has no issues panning/zooming smoothly on large RAW images. It's not as responsive as Aperture though; Lightroom is not well optimized for OS X since it's cross-platform. It works well enough though. Recanting statement since I misspoke (poor reading comprehension skills apparently). Removing to reduce future confusion. This is a terrible graph to use for this question. NONE of those computers are quad cores. It only tells the story that a faster processor (mhz/ghz) will beat out a slower one. 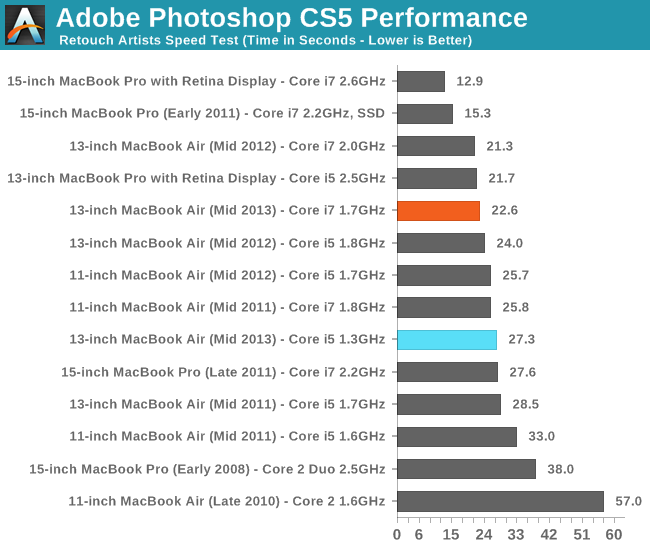 It doesn't show whether or not Lightroom can use a quad core. For all we know (according to this graph) Lightroom is single threaded and thus of course would be faster with a faster processor. Uhmmmm... Could you please tell me the price difference between the dual core and quad core rMBP 15 and 2011 MBP 15 again? In all seriousness, please look at the 2 outliers at the top of the graphs... Hint: those are the quads. Crap. Valid point. I read those as the 13" rMBP's. I recant my statement. Can anyone who has actually tried LR5 with a 2014 Mini post your experience?